Tools incorporating the latest detection technologies have become indispensible in everyday construction work. Cordless detection systems now help to make steel rebars in concrete visible – quickly, easily and without need for destructive procedures. Detection systems come into their own, above all, in situations where existing structures require to be monitored or where the need for repair must be assessed without resorting to destructive procedures. Detection systems such as the Hilti Ferroscan PS200 locate reinforcing bars under the concrete surface in bridges and other structures. Especially in the fields of structural renovation and quality control, the ability to locate and assess the steel reinforcement concealed beneath the surface of a concrete structure can be of great importance. In the past, especially where industrial structures, concrete floor decks and walls, beams, square-edged columns and critical areas of tunnels and bridges are concerned, this has not always been possible without actually physically removing concrete from the surfaces in question. In situations such as these, high-tech detection systems can be of tremendous assistance. These systems are capable of determining the number of rebars present, their positions, depths and diameters, and can provide a reliable image of the concealed reinforcement simply by scanning over the surface of the structure. Cordless detection systems such as the Ferroscan PS200 from Hilti consist of a scanner, monitor unit and PC software. After passing the scanner over the surface of the structure, the positions of the reinforcing bars can be marked directly on the concrete or the applicable data recorded and transferred right away, on site, to the portable monitor unit for viewing and evaluation. 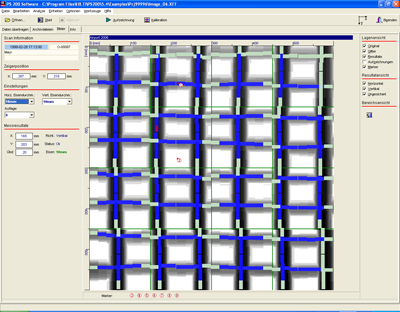 The system can help to rule out the possibility of damage to steel reinforcement. Costly delays and damage to rebars as a result of hammer drilling or core drilling can be avoided and the holes to be drilled can be positioned accurately and correctly right from the beginning. The data provided by this system thus saves time and cuts costs. With its Quickscan function, the Ferroscan PS200 is capable of scanning a section up to 30m long in a single, continuous pass, during which it records the depth of concrete cover over the uppermost reinforcement layer. 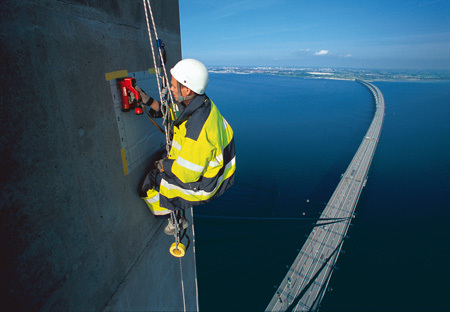 This has proved very effective, especially on bridges, where the minimum depth of concrete cover is a critical factor and where this data is required for quality control, for example, with precast concrete components. The software developed by Hilti for use with Ferroscan is of great assistance in tasks such as the preparation of assessment reports as well as evaluation and further processing of scan data on a PC. The system employs the magnetic resonance principle to detect the reinforcing bars. The scanner generates a magnetic field and interprets the variations in magnetic resonance caused by the reinforcing bars within this field. The position and diameter of the bars, as well as the depth of concrete cover over them, can thus be determined at any desired location on the structure. The monitor unit of the Ferroscan system can also be shared conveniently by several users who work with their own cordless scanners while making use of the system’s infrared data transfer feature. Using this method, large areas can be scanned quickly, reliably and at a fraction of the cost of purchasing several complete systems. processing of the data, including the preparation of assessment reports and statistics ready for printing. Data stored in the system monitor can be transferred to the PC in a few seconds. Large volumes of data can thus be processed quickly and automatically, allowing quick and accurate assessment of the structure and the ability to print or export image and data files in many standard formats. Thanks to the audio connection on the Ferroscan monitor, even voice recordings can be made to supplement the scan data, and these recordings subsequently transferred to the PC together with the other data. Hilti has continued to develop the Ferroscan PS200 system in order to meet the needs of experts in construction better than ever. Accordingly, the scanner now no longer requires calibration each time before use and the new 'Quickscan with accurate depth measurement' function allows more precise measurement of depth of concrete cover. Also new is the full-screen analysis feature that allows on-the-spot checks for safer drilling. The monitor unit, with its USB interface, makes the previous active data synchronisation operation unnecessary and thus simplifies the exchange of data between the monitor and the PC. Several functions have also been added to the PC software for improved area evaluation and statistics. Whole sections of tunnels or bridges and other large-area structures can now be displayed in a clear overview for easy assessment, visualisation and evaluation. Hilti’s calibration service allows professionals in the construction trades to rely on their measuring tools. Regular checks carried out within the scope of this service guarantee reliability in accordance with the applicable standards and statutory requirements. A calibration certificate and a sticker on the tool confirms that it works accurately, within specifications. Hilti also offers fleet management, which for a fixed monthly charge covers all tool, service and repair costs, simplifying financial planning and relieving owners from administrative work. There are no hidden costs; all tools in the fleet are replaced at regular intervals with tools of the latest generation, thus helping to avoid costly downtime and ensuring compliance with the latest safety standards. Even if a defect occurs in a tool, Hilti will take care of it completely free of charge for up to two years from date of purchase. After that Hilti continues to prove the quality of its products by putting a limit on what a repair can cost – for as long as you continue using your tool. Hilti offers a lifetime manufacturer’s warranty against manufacturing defects.